The tundra landscape at Toolik Field Station, Alaska. Photo by Nell Kemp. 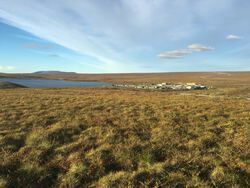 Understanding how microbes and sunlight interact is particularly important in the Arctic where thawing permafrost soils will release large amounts of carbon from land to water. Advancing our understanding of loss of this carbon to the atmosphere is critical to understanding the global carbon cycle. This project takes advantage of recent advances in microbial genomics and carbon chemistry to improve understanding of carbon cycling in Arctic freshwaters. The research team will be looking to answer three questions: 1) How is microbial metabolism controlled by dissolved organic carbon (DOC) chemistry? 2) How does DOC exposure to sunlight change how microbes convert DOC to carbon dioxide (CO2) 3) How does the longer-term adaptation of microbial communities affect the rate of DOC conversion to carbon dioxide? Lauren Watel adds enzymes to the filters that contain microbes collected in the field, to start the process of DNA extraction. Toolik Field Station, Alaska. Photo by Regina Brinker The research team will be based out of Toolik Field Station located in the northern foothills of the Brooks Range in northern Alaska. Toolik Field Station is operated by the Institute of Arctic Biology at the University of Alaska Fairbanks and has hosted hundreds of researchers and students every year since 1975. Research sites will be accessed by hiking, vehicle and helicopter. David Walker teaches innovative courses in Earth Science and Organic Chemistry at LASA High School, a public magnet school in Austin, Texas. His favorite thing about teaching is having the opportunity to make the natural world more interesting for his students every day. This opportunity is his passion point, and it constantly motivates him to improve. An avid backpacker, fly fisherman, and birder, he loves to bring his experiences, personal knowledge, and insights to life in engaging, meaningful learning activities for his students. David advocates a project- and place-based teaching model and encourages his students to investigate nature through unique field trips and research projects in Austin-area laboratories, parks, and preserves. He also coaches the LASA Science Olympiad team, through which he has helped inspire students to study science beyond classroom requirements and expose students to many scientific fields and disciplines not typically encountered in high school. David plans to directly integrate his research experience in the Arctic into his classroom. In doing so, he hopes to enrich his curriculum with a wealth of relatable personal experiences, enhance the project-based field research components of his courses, expose his students to unique careers and fields in science, and inspire his students to seek out additional learning opportunities outside of the classroom. Looking forward to reading more about your upcoming adventures!